The Brooks “Pure” project is the line of somewhat-minimalist shoes that the company makes. Some would call them a line of lightweight trainers due to their plush feel, but the low heel drop and increased flexibility of these shoes do give them a more minimalist feel. The PureCadence is one of the few minimalist shoes on the market that provides some stability for the overpronator. It comes in at a significantly lighter weight than most stability shoes, and sits flatter to the ground than most, but it provides a moderate amount of stability. The original PureCadence debuted just a couple years ago. The second model, the PureCadence2, made a few small tweaks to the original: instead of centered laces and a separated tongue the PureCadence2 featured asymmetrical laces and a “burrito wrap” tongue that was attached on one side. The PureCadence3 arrived this year with a few more changes. The burrito wrap tongue has flipped sides, so instead of attaching on the lateral side of the shoe it attaches on the medial side. There was also a change in the “nav band” that wraps the midfoot of the shoe. While the sole of the PureCadence remained the same from the original model to the second iteration, the third model features a more segmented sole, especially under the arch where the heel of the shoe connects to the forefoot. The first two models of the shoe featured a split in the front that isolated the big toe, which helped to engage the big toe and thus engage the arch of the foot more naturally. The PureCadence3 splits down the middle, using the two biggest toes instead of just the first toe. While the PureCadence line is meant to fit like a glove around the foot, the PureCadence3 seems to have an especially narrow fit. This is mostly in the middle of the shoe, where the nav band holds tightly around the midfoot. I found that the toe box had a good amount of space, but I did feel that the middle of the shoe fit a little more closely than most shoes. I actually ended up wearing a half size smaller than normal in the PureCadence3. I was really on the border between my regular size and a half size down, but I went with the smaller size because I didn’t want too much space in a minimalist shoe. I never noticed the burrito tongue in either a good way or a bad way. In fact, I never had a problem with it on the second model when it wrapped the opposite direction or in the original PureCadence when it was separated. I did have issues with the tongue sliding off the side on the original version of the PureFlow (the neutral equivalent of the PureCadence), which I think is why Brooks went to the burrito tongue, but I never had the problem in the PureCadence line. All of the Pure shoes come with “bubble” laces, which are more illustratively described as “sausage-link” laces. I love these laces, because they hold really well and do not slip. The asymmetrical lacing is nice because it takes some pressure off of the top of the foot. Overall the lacing on this shoe works really well. There were some things that I really liked about the re-worked sole on the PureCadence3, and some things that I did not like as much. The heel-to-toe transition on this shoe is incredible. It has a great natural roll, and it really pops off of the toe. The segmentation of the sole under the arch really helps make this transition of this shoe smooth and it gives the shoe a more minimalist feel. On the other hand, I did not love how all of the segments of the sole felt under my feet. In addition to being a touch firmer than the previous models, I could feel some of the segments of the sole a little too much. I wanted a more natural feel under my feet, one where I didn’t even notice that I had a shoe on my foot. The durability of the PureCadence3 seemed fine, similar to the previous models. As with most minimalist shoes, you can probably expect between 250 and 300 miles out of these shoes. I found that the outsole and the upper hold up quite well. The cushion in the midsole is what goes first – it starts to feel flat and loses its softness as you beat it down. Overall I did like the Purecadence3. I liked the PureCadence2 a little better, but I will still use the PureCadence3 regularly in my training. The heel-to-toe transition really impressed me and kept me coming back for more, and the lower heel drop gave the shoe a different feel than anything else that I run in. I personally like this shoe as a tool to throw in to my training once or twice a week to help strengthen and balance out different muscles, but I know a few people who use the Pure line of shoes full time and love them. I have also noticed that these shoes are incredibly popular in mid-distance races, especially ten milers and half marathons. The Pure shoes tend to provide a little more width and support than most racing flats, without adding too much weight, so these might be considered the lightweight racing shoes for the average person. The Brooks “Pure” line of shoes is a versatile line that I would recommend for a runner looking to add something with a more minimalist feel to their arsenal (without going too minimalist), those who like really light shoes, or those looking for a good shoe to race in. 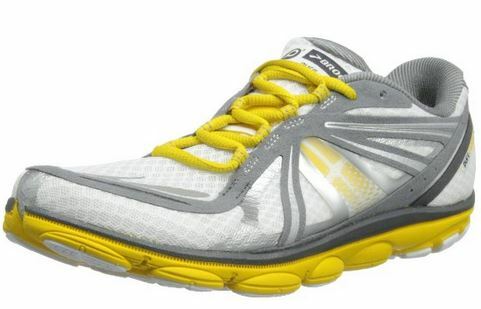 This entry was posted in Brooks, Running Shoes and tagged Brooks PureCadence 3.